Children may also have kyphosis, which is an abnormal forward curve, usually the upper back. Most cases of scoliosis begin when a child is around 8-10 years old with gradual progression of the abnormal curvature as they continue to grow. However, it can present at any age, including newborns. There are several types and classifications of scoliosis. They may also be classified by age at onset as congenital, infant, juvenile, or adolescent. 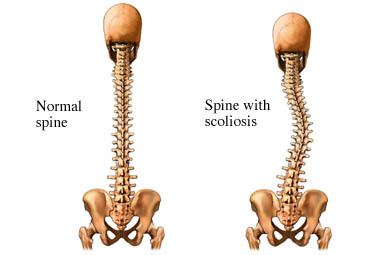 Functional scoliosis is the result of an underlying condition that affects the alignment of the spine due to muscle imbalances, differing leg lengths, or other health conditions that cause the muscles to tense and spasm. This type of scoliosis can be reversed by treating the underlying condition. What are the risk factors for scoliosis?What are the symptoms of scoliosis?How is scoliosis diagnosed?What are the treatments for scoliosis?Are there screening tests for scoliosis?How can I reduce my risk of scoliosis?What questions should I ask my doctor?What is it like to live with scoliosis?Where can I get more information about scoliosis? Adolescent idiopathic scoliosis. EBSCO DynaMed Plus website. Available at: http://www.dynamed.com/topics/dmp~AN~T116647/Adolescent-idiopathic-scoliosis. Updated March 18, 2017. Accessed May 16, 2017. Altaf F, Gibson A, Dannawi Z, Noordeen H. Adolescent idiopathic scoliosis. BMJ. 2013;346:f2508. Congenital scoliosis and kyphosis. EBSCO DynaMed Plus website. Available at: http://www.dynamed.com/topics/dmp~AN~T908760/Congenital-scoliosis-and-kyphosis. Updated January 19, 2016. Accessed May 16, 2017. Idiopathic scoliosis in children and adolescents. Ortho Info—American Academy of Orthopedic Surgeons website. Available at: http://orthoinfo.org/topic.cfm?topic=A00353. Updated March 2015. Accessed May 16, 2017. Infantile and juvenile idiopathic scoliosis. EBSCO DynaMed Plus website. Available at: http://www.dynamed.com/topics/dmp~AN~T908759/Infantile-and-juvenile-idiopathic-scoliosis. Updated July 13, 2016. Accessed May 16, 2017. Questions and answers about scoliosis in children and adolescents. National Institute of Arthritis and Musculoskeletal and Skin Diseases website. Available at: https://www.niams.nih.gov/Health%5FInfo/Scoliosis/default.asp. Updated December 2015. Accessed May 16, 2017. Trobisch P, Suess O, Schwab F. Idiopathic scoliosis. Dtsch Arztebl Int. 2010;107(49):875-883. What is scoliosis? Fast facts: An easy-to-read series of publications for the public. National Institute of Arthritis and Musculoskeletal and Skin Diseases website. Available at: https://www.niams.nih.gov/Health%5FInfo/Scoliosis/scoliosis%5Fff.asp. Updated November 2014. Accessed May 16, 2017.